Explaining what the Heirloom Set is and how to get it in Apex Legends. In Apex Legends, players have the opportunity to randomly earn cosmetic items, including the elusive Heirloom Set. Right now, there’s only one unlockable Heirloom Set available for Wraith. While a few players have acquired the Heirloom Set, many more have been struggling to find it as it has an extremely low drop chance. Looking to get your hands on this Heirloom Set for Wraith? We’ve got you covered. Below, we’ve put together a quick guide explaining how to get the Heirloom Set in Apex Legends. The Heirloom Set contains exclusive cosmetic items for Wraith in Apex Legends. In Apex Legends, the Heirloom Set is comprised of cosmetic items for Wraith. To get these Heirloom items, players will need to earn or purchase Apex Packs. You can earn Apex Packs for free by leveling up, with 45 Apex Packs awarded between levels 1-100 in Apex Legends. You can also purchase Apex Coins in the Store and exchange them for Apex Packs if you want to open several packs in a row. “Apex Legends currently has one bonus Heirloom Set available, which contains three items for Wraith. When a player opens an Apex Pack, there is a <1% probability of an Heirloom Set dropping. Heirloom Set drops do not deduct an Apex Pack from your inventory. Heirloom Sets cannot be crafted with Crafting Metals. Interestingly, Respawn seems to confirm that additional Heirloom Sets for other Legends characters will be added to the game in the future. As of right now, though, the only Heirloom Set in Apex Legends is exclusively available for Wraith. Wondering what’s included in the Heirloom Set for Wraith? 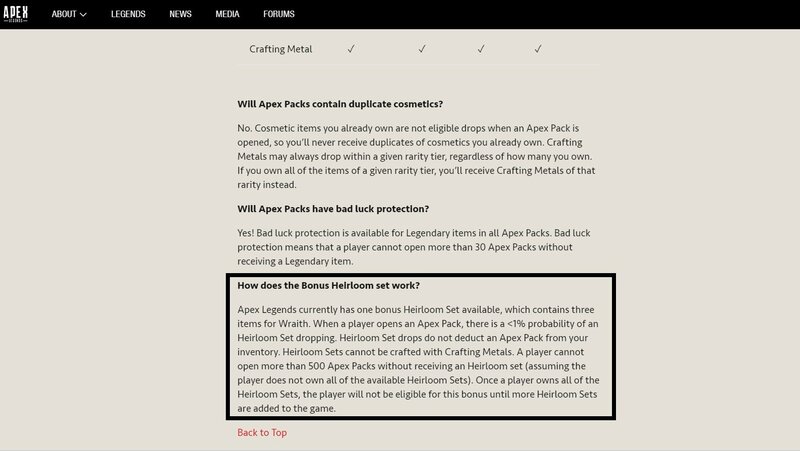 Respawn Entertainment explains that players cannot open more than 500 Apex Packs without receiving an Heirloom Set in Apex Legends. As noted above, the Heirloom Set offers three different cosmetic items for Wraith which we’ve listed down below. To quickly recap, the Heirloom Set contains three exclusive items for Wraith. 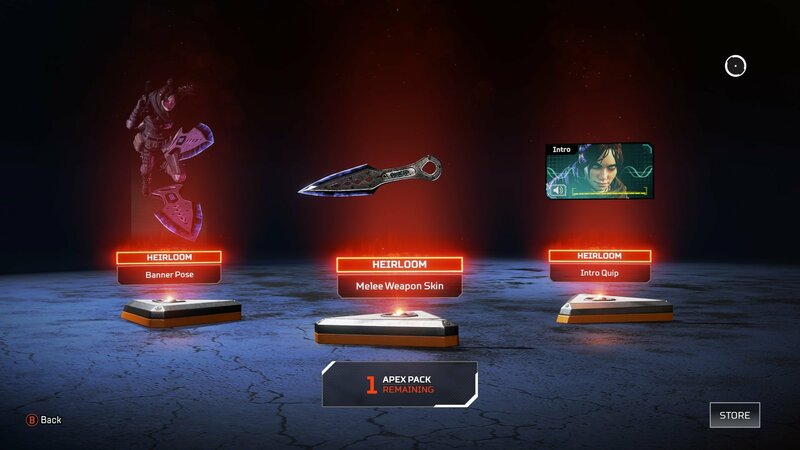 The only way to get the Heirloom Set is by opening Apex Packs in Apex Legends. As noted by Respawn, players can’t open more than 500 Apex Packs without earning an Heirloom Set. To get Apex Packs for free, you’ll need to level up in Apex Legends, with 45 Apex Packs available between levels 1-100. Alternatively, you can purchase Apex Coins in the Store and use them to buy multiple Apex Packs. In the future, we speculate these Heirloom Set items could potentially be offered in the Battle Pass for Apex Legends, though this prediction is entirely speculative. After reviewing the steps needed to get the Heirloom Set for Wraith in Apex Legends, what are your thoughts? Are you looking to earn these Heirloom Set items, or will you wait until Heirloom Set items are added for other characters like Lifeline? Let us know down in the comments below! For more on Apex Legends, be sure to check out some of our previous guides including the best weapons to use in Apex Legends, the drop points with the best loot in Apex Legends, and whether or not you can play single player in Apex Legends.